"Other blogs got there first but I am delighted to confirm that Samuel Coates, Deputy Editor of ConservativeHome, looks set to join David Cameron's office as part of the speechwriting team. At the age of 22, Sam's likely appointment after a number of competitive tests and interviews is a tremendous personal achievement, I wish him every success. His commitment to the social justice agenda and his interest in international human rights will be just two of the significant contributions I know he'll make to Team Cameron. David Cameron's gain is definitely a big loss to ConservativeHome. Sam has become a very good friend over the two-and-a-half years we have worked together, and I'll miss his company as well as his enormous contribution to this website. Today is a day for congratulating Sam. We'll be announcing the recruitment process for his successor tomorrow." 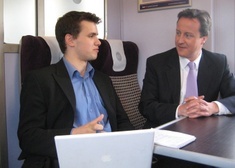 > The photo of Sam and David Cameron was from a recent 'Day in the life of David Cameron' feature. Sam's namesake at The Times will be pleased that there'll now only be one Sam Coates covering Westminster! I'm delighted for Sam. He is a really good guy and totally without side. What an exciting challenge for a great young guy. Well done. Glad to see good things can happen to nice people after all! This is a tremendous tribute to Sam (and real recognition of the importance of Conservative Home, which should but probably won't silence those who have tried to suggest it is not a respected voice). Sam, we will miss you, but I guess you will keep in touch - we may even spot a new anonymous contributor! Enjoy the new job; it's a great opportunity for you, and a really important role. Go well. Wonderful news / terrible news! Sam's one of politics' really genuine people. Idealistic, talented, kind and hard-working. I know several people considered for this and I'm happy to say a wise appointment was made. Sam's humble nature hides a surprisingly shrewd intellect. His northernness should balance out the office as well. I just hope he doesn't get bored! Best of luck in the new job, lets get the Conservatives back down to earth and ready for Government! A good move by Cameron but a loss to this site.Good luck Sam and power to bloggers. Many congratulations Sam! ConHome's loss is definately DC's gain. Sam is one of life's genuine good guys. It's a incredible opportunity for him. Best of luck, Sam. Very many congratulations to Sam. Congratulation, Sam - a good appointment and a great opportunity for you. I'm sure you'll make a great success of it. Good news that someone from the coalface should be recognised!! Don't forget the strong feelings on the inequality of the tax system Sam, particularly for those on earnings below £15000 p.a. Congratulations Sam! Very well done - David Cameron's Office's gain is Con Home's loss and your successor will have a lot to live up to! Good luck and keep in touch. This really is great news - fully deserved. Best of luck, Sam! Sam, I'm really pleased for you -congratulations! See, we are capable of leaving nice/positive messages on ConHome! Many thanks for your good wishes, everyone. However I have to announce I've decided to turn the job down, and join the Socialist Workers Party instead. And I hearby appoint Comstock as my successor, who's first job will be to oversee this blog's move towards a more left wing view point. Excellent news for DC; sad for us though. At risk of repeating what many others have said, I'm absolutely delighted to see such a nice and decent guy in this position. Again, well done mate and I look forward to buying you a pint to celebrate soon. Many congratulations, and well done, Sam! It would be great if you could blog here occasionally from 'inside the leader's office' - that's only for public consumption, of course. What a great opportunity! Congratulations, Sam. Yes, I'd be interested to hear how you get on, and especially to read one of your speeches. As Jill points out,though, I realise a fair bit of your new job will require discrection. Good luck, Sam and best wishes. Great news for the party and a real tribute to the quality of this blog that one of its 'sons' has been taken close to the centre. Good luck to Sam, a top guy and a good appointment for David Cameron too. Many congratulations Sam - it's thoroughly deserved. Sam, you've already had my congratulations by private email but I want to add them publicity on here too. You are a top bloke and will go far. Very well done. Suggest everyone visits Guido tonight. There's a cracking fake picture tale which could have quite an impact on Glasgow East. LET THE BLOODBATH FOR HIS SUCCESSOR BEGIN! Sam has been enormously patient helping me to file posts for Centre Right - in the manner of an air traffic controller dealing with a hysterical passenger accidentally left in charge of an aeroplane. Now he has the (even) more intellectually satisfying challenge of writing speeches for our next Prime Minister. Hats off to him. Many congratulations to Sam. Team Cameron have just made a very wise addition. Congratulations and best wishes for your new role. Many congratulations Sam! Wow ! A speech writer who know where all the bodies are buried under their URLs!!!!!! Go to it lad! I completely agree with what has been said already that DC's gain is CH's loss! Congratulations to Sam. A wonderful addition to Team Cameron. Congratulations Sam. This is really very well deserved and at the age of 22, a remarkable achievement. Well done! Well done Sam!!! Your help won't be able to stop us Lib dems preparting for goverment, but fabulous congratulatons all the same! These are excriting times. Well done Sam. I expect we will see your reincarnation as Toby Lightwater - nice little earner,too. I add my congratulations to the many already expressed. Now you can be an even bigger part of our shared Conservative Future. Good Luck for all of us. Many congratulations Sam. You'll be missed. Well done and good luck Sam. Hmmm. So, Sam, you left university before completing your degree and have now landed one of the top jobs in politics! I'm looking forward to outlining that career trajectory to my students...! You free for our careers fair?! Congratulations Sam, ConHome's loss is definitely Team Cameron's gain. as his speeches will thus reach new heights. and the nation soon put back to rights. But what of what’s left, of S. Coates’ skills bereft? A Dep Ed you need to fast seek. from edding a seven day week! Well done Sam, I hope the job goes well it does sound like a terrific opportunity. Brilliant McGonagall, and so true!! And thanks to everyone for their kind comments on this thread. It's a real testimony to Sam that he is held in such high regard by so many good people. I apologise that we weren't able to make the announcement sooner. Although we knew the appointment was likely for quite some time we couldn't formally announce until some i's had been dotted and t's crossed. Great news! Keep my fingers crossed for him! Great news. Congrats to Sam. He'll be a great representative of 'Blog World'. I'd like to add my congratulations. Quite impressive for a 22-year old! But don't spend your whole life in politics. After a couple of years, it's good and important to do something in the "real" world. Congratulations Sam and many best wishes. Well done, Sam. I hope DC benefits from your honesty. Sam, Many congratulations and good luck in your new job. This is very good news for Samuel and I wish him the best of luck. Sam and Tim are both to be congratulated for making this website what it is - I'm sure the gravitas ConservativeHome has in addition to the core role Sam played in getting the site into that positon helped him land this exciting new job. Well done Sam, heard the news from my brother in Kent who heard it from Ingleton in Yorkshire! We liberal Catholics love you too. Well done Sam. But is he a good enough speech writer to smuggle in little clues that he wrote it? Our congratulations go to David Cameron for selecting such a talented, thoughtful, committed person as Sam Coates as his speech writer. Congratulations to you too Sam for having the qualities of integrity,and rock solid core values wrapped in a packet of insight wit, good humor, cultural conectedness and genuine compassion that have brought you to the attention of Britain's next P.M.
Best of luck in the future in DC's office. Can't wait to hear a knock-out speech by you smashing across the dispatch box! Well done Sam--and well done Sam's former boss for your part, and new boss for good judgement.